Humanity: More Good or Evil? Using the links below, you will use the research tool SCRIBLE to gather facts and to make comments on that information in one common article and two you choose to read in your exploration of evil in humanity as relates to key psychological experiments and historical atrocities (optional). * Sign in to research tool Scrible using GSuite account. Make a project called "Evil" and add the Scrible Toolbar. ​ * Open a common source: “Are Humans Good or Evil? Naughty or nice?” for periods 1, 2, & 3. 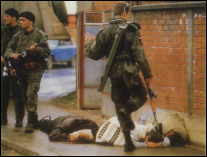 ​ * Periods 7 & 8, open "What Makes Good People Do Bad Things?" Highlight 6+ most interesting or important sentences. Choose 3+ on which to write side comments AND questions the material sparks that could work for the class discussion. * Log in to GCPS Portal, G Suite, eClass Course Page, Media Center page. * Open eClass Discussion Padlet to see how and where you will post your best good and evil in humanity open-ended question by the end of next block. * Mark passages (6+ in each) and make comments (3+ in each) in two more sources, at least one from the list below. The second source can also be an article below or another source that deals with atrocities of history, good and evil ideologies, or the Milgram or Stanford experiments. * Continue your research in Scrible to complete at least three sources and a minimum of 20 passages (quotations) from them with 10 personalized comments and questions as annotations. ​ * Print out the "Create Summary" feature of your highlights from sources and comments to turn in for a research process grade and for use in your graded discussion. * YOUR OPEN-ENDED QUESTION (See section* below for guidance on questions.) must be posted by today on the eClass Padlet. Don't duplicate a classmate's question. * Receive your group number assignment to know when you will be inner and outer circles and read over your printed research notes to prep for the Graded Discussion. * Participate in Discussion while in inner circle to earn discussion tallies that a classmate in the outer circle will help mark on your rubric. 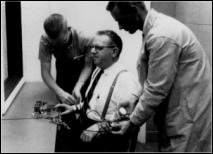 "Milgram's Experiments and the Perils of Obedience"
"What Makes Good People Do Bad Things?" "The Real Meaning of 'Good' and 'Evil'"
"Do Good People Turn Evil?" ​Open-ended: Questions are designed to elicit multiple perspectives. Numerous answers can be correct as long as the students stay on topic. Thought-provoking: To start, questions should spark numerous responses. Then, they should challenge students to evaluate and synthesize their ideas. Clear: Participants should be able to understand right away what the facilitator is asking. This means phrasing questions carefully to keep them short and simple, even when the topic is complex. Group 1: Does EVIL exist, or do people just do bad things? Explain. Group 2: Is it easier for people to conform rather than to act on their own individual values? Why or why not? Group 3: If people are following orders, should they be held responsible for their decisions and actions? Why or why not? Group 4: In The Diary of a Young Girl, Anne Frank wrote, "It's a wonder I haven't abandoned all my ideals, they seem so absurd and impractical. Yet I cling to them because I still believe, in spite of everything, that people are truly good at heart." Why do you agree or disagree with her opinion? "Bad Apples and Bad Barrels"
"Think You're Above Doing Evil? Think Again."